Although I've played a number of Pokémon games over the years--including Red, Blue, Emerald, Diamond and Black--only the original pair entranced me to the point that I played it from start to finish. 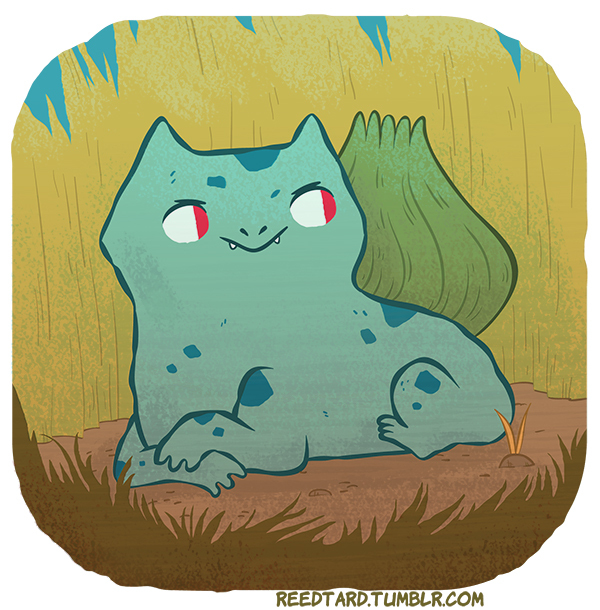 Oddly, although I played the hell out of both Pokémon Red and Blue as a youngster, I don't remember ever picking Bulbasaur as my starter. I now find that kind of crazy, as every time I see an illustration of the little bugger these days I can't help but think, "aw, what a cutie!" That thought certainly crossed my mind when I happened upon the drawing above, which was conjured up by artist Reed Bond. "Always seems to me like every Pokémon is hiding in the grass waiting to pick a fight," Bond says about his creation over on Flickr. "I imagine that's what is going through this guy's head." Thanks, Marco! 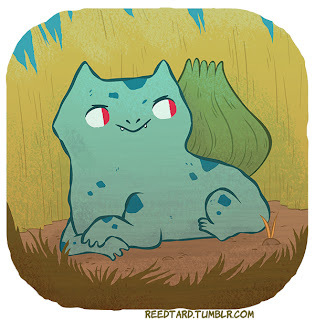 If you like this one, you should check out Reed's other Pokemon illustrations. This one is my favorite, though. Yes, check them out. I think you'll like them. If you don't mind me asking: Why do you tend to always pick grass-type Pokemon? Are they the most versatile or useful?